Say what you want about Valentine’s Day.. It’s a gimmick.. The greeting card companies invented it.. The day’s depressing for singles..
Just realize that this is the one day of the year that you can eat chocolate and not feel guilty about it. Oh, and while we’re at it, lemme make this clear. It’s NOT ValentiMe’s Day. Those who say that should be damned to an eternity of changing Cupid’s diapers. Back to the chocolate. I love seeing those big obnoxious hearts filled with all kinds of goodie-filled cocoa creations. While the store-bought varieties are perfection, it’s important to realize that the day is meant to celebrate love. In my opinion there’s no better way of showing love than cooking for someone. 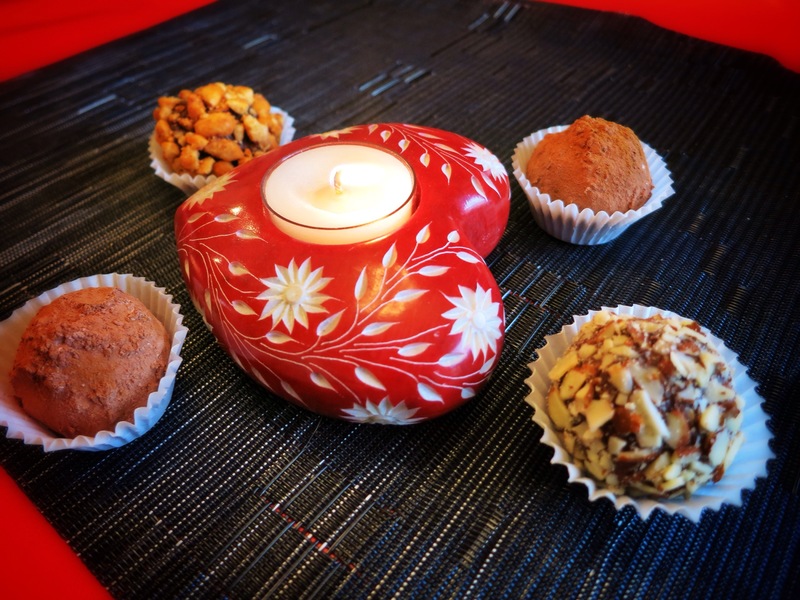 I think you should definitely cook dinner for your sweetheart or make them breakfast (the holiday falls on a Saturday this year), but why not create your own sweet treats? I’m here to help, and what I’m sharing with you doesn’t really involve cooking! How about that?! 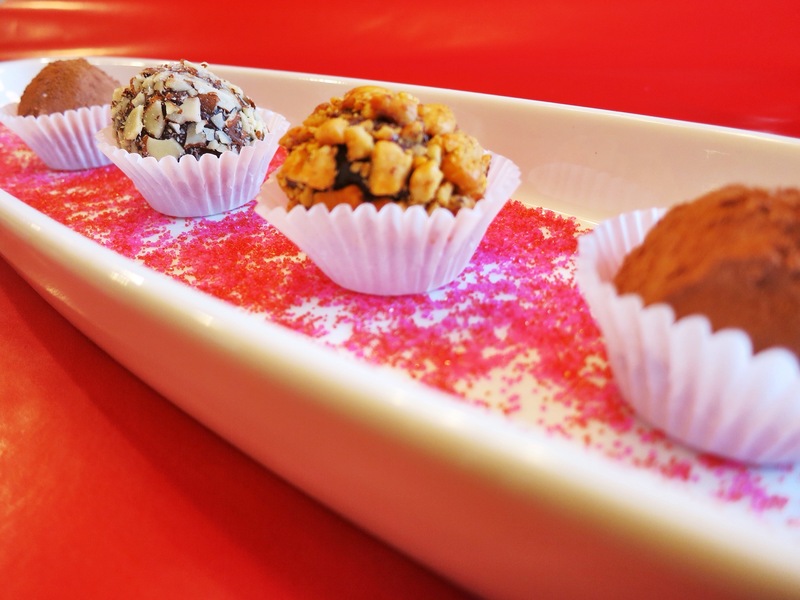 Handmade chocolate truffles are my kryptonite. I adore them. 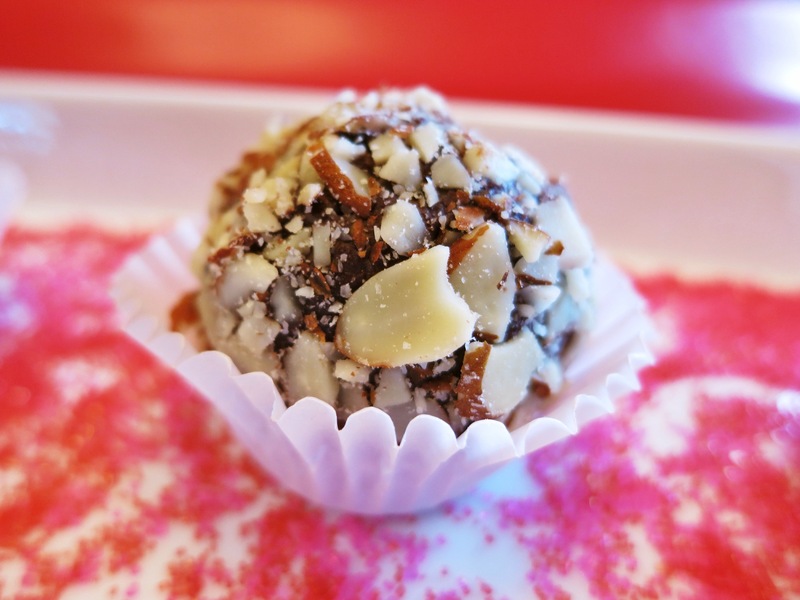 Sure chocolatiers go all out and temper chocolate, use molds, and concoct fancy fillings. 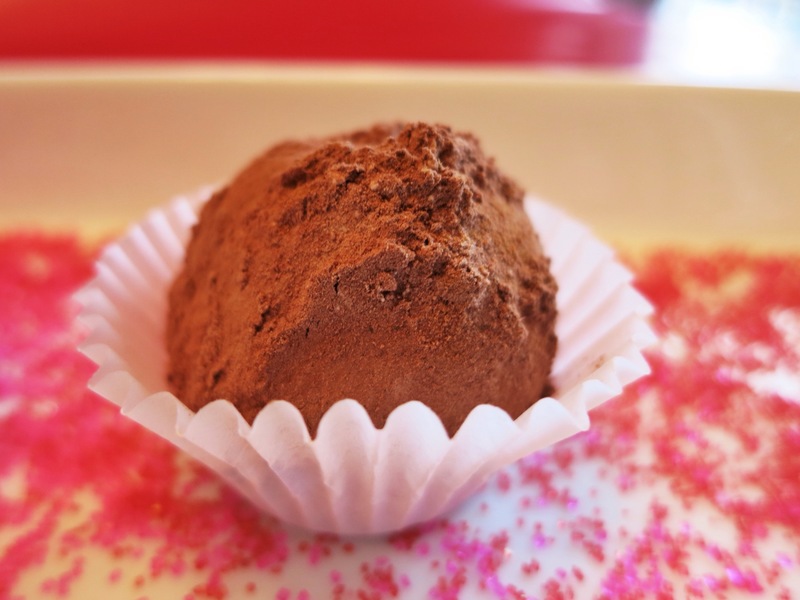 Here’s the truth, though: truffles aren’t as difficult as they seem. First thing’s first. Accept the fact that this is a hands-on gift and your hands will get dirty! But it’s chocolate, so is it really that bad? Rocky Road (marshmallow in the center, rolled in almonds). 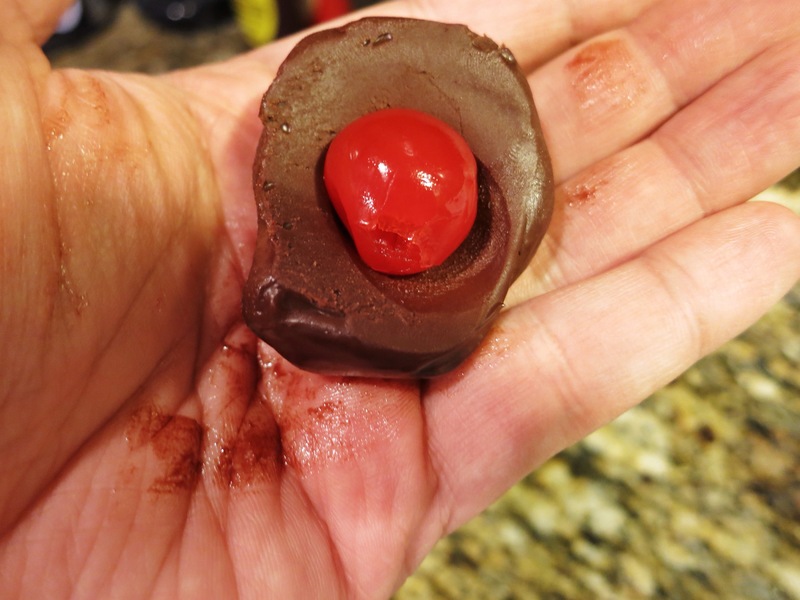 Chocolate-covered Cherry (maraschino cherry center, rolled in sweet cocoa). Cinnamon (ganache center, rolled in spiced-sweet cocoa). The basis for all four is a simple dark chocolate ganache. 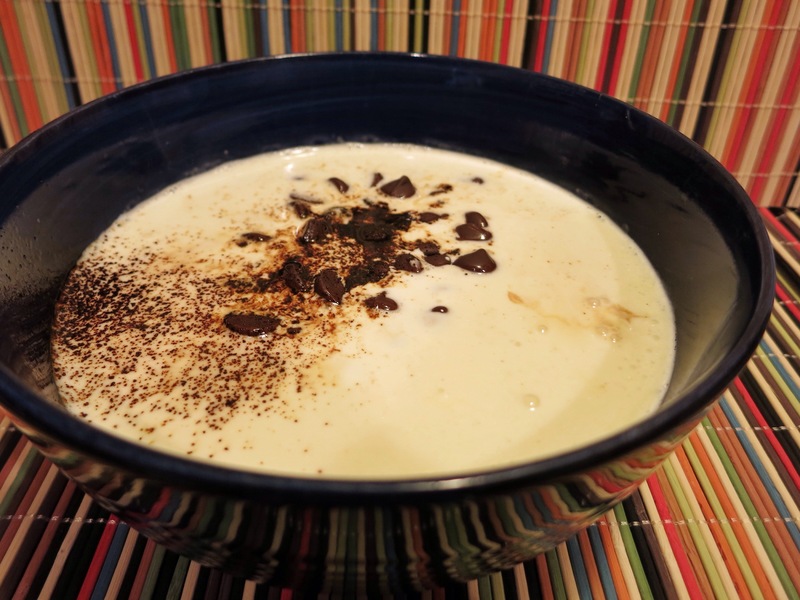 In a microwave-safe bowl, microwave the cream for 3 minutes, or until it starts to bubble. Take the bubbling cream out of the microwave and add in the chocolate, the vanilla, and the espresso powder (if using). The espresso just creates a deeper flavor and enhances the chocolate. It doesn’t make it taste like coffee. Make sure the chips are submerged. Let the mixture sit for 3-4 minutes, then whisk it together till smooth. Let it sit at room temperature for about 10 minutes. Cover and refrigerate for at least an hour. This can be done a day ahead. In that time, the ganache will set up. 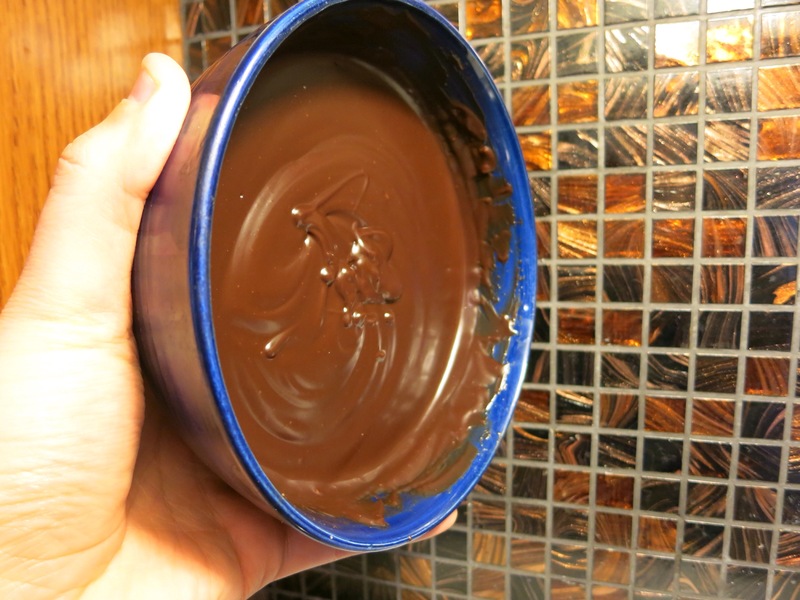 You can hold the bowl vertically and the ganache won’t move. It should be that solid. Line a large cookie sheet, or 2 small ones, with wax paper. 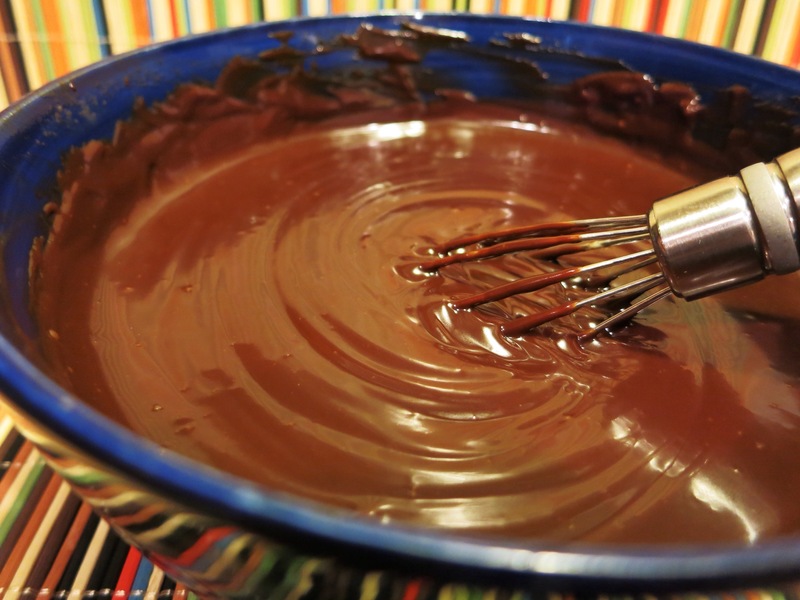 Using an actual teaspoon, scoop out mounds of the ganache and set them on the wax paper. You should get about 24 mounds. Set the mounds back in the fridge for about 30 minutes to solidify. You can make 6 of each of the varieties above or you can choose 1 or 2 and focus on them. Your choice! Just have your fillings and coatings ready to go. First, line a 9×13 baking dish with was paper. Decide how many you’ll be making. You’ll want to take that many maraschino cherries out of the jar and set them on paper towels to drain for at least 10 minutes. For each truffle, take a mound of ganache, make an indention with your thumb, insert one cherry, and then smooth the ganache around it to cover. Then roll into a ball. 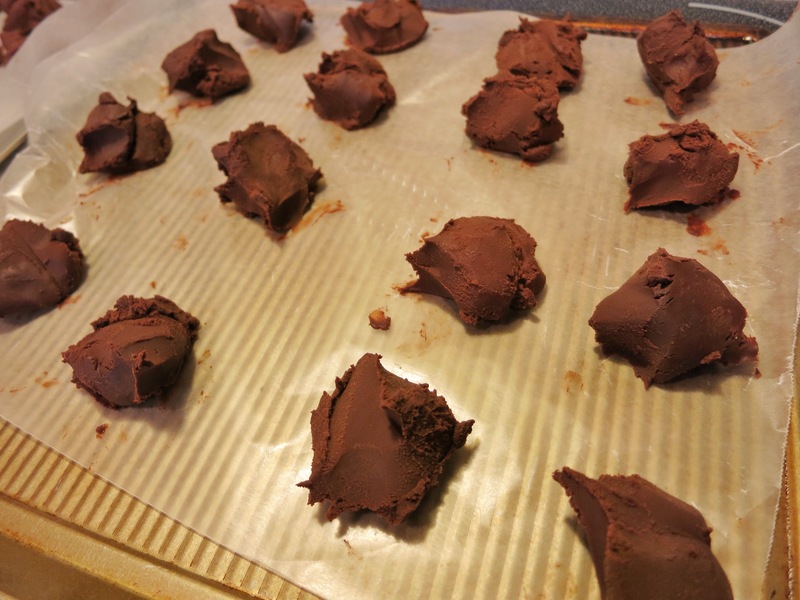 Set each one back on the lined cookie sheet, and roll as many more cherry truffles as you’d like to make. 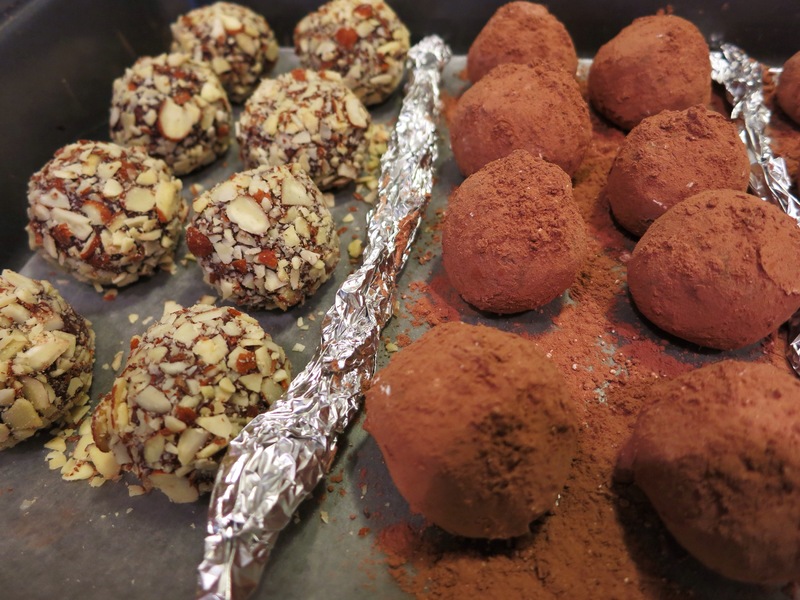 Roll each cherry-filled truffle in the coating individually and set onto the lined baking dish. 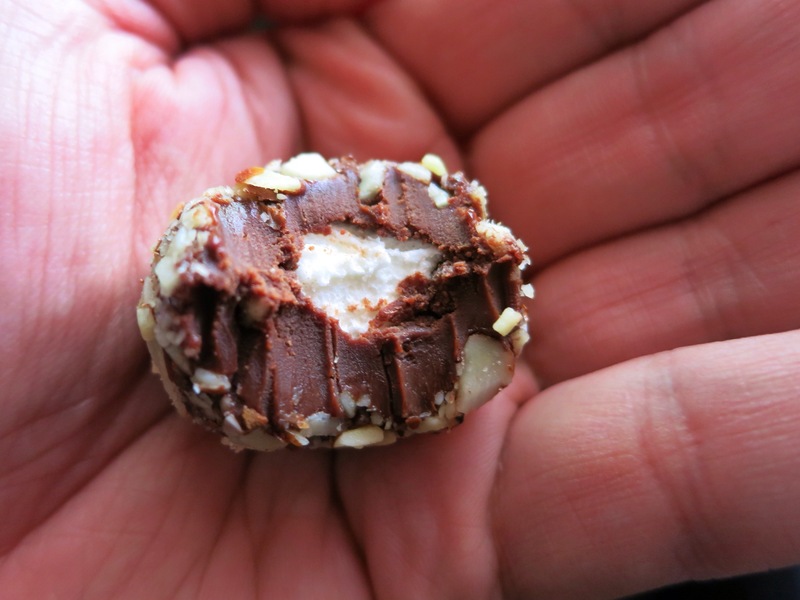 You’ll need one mini marshmallow for each truffle you want to make. 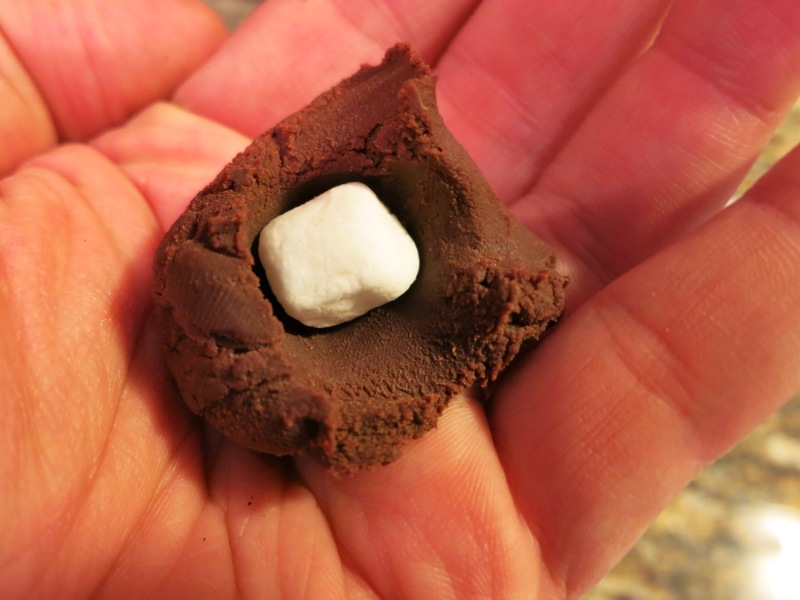 Make an indentation in a ganache mound with your thumb, insert a marshmallow, cover with the ganache, and roll into a ball. Return to lined baking sheet, and make as many as you’d like. For the coating, crush a small bag of sliced almonds (find in the baking aisle) with your fingers, then roll each marshmallow-filled truffle individually in the almonds till coated. Set on lined baking dish. Roll each ganache mound into a ball and return to lined baking sheet. Roll each truffle in the spiced coating. Then sprinkle on a little cinnamon just to give each truffle a golden sheen. I used a can of chipotle peanuts for the coating. If you can’t find them, use any kind of spiced-peanuts. You could even use wasabi peas or just plain salted peanuts. Crush them with a meat mallet, a frying pan, or a potato masher. 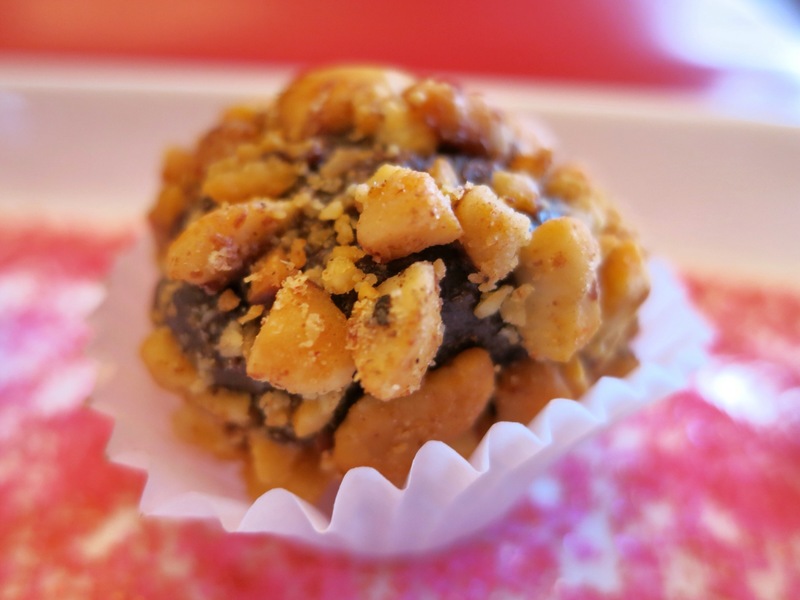 Roll each truffle in the crushed peanuts. If making multiple varities, use crumpled aluminum foil for dividers. Cover the baking dish and keep in the fridge. These truffles are best at room temperature, so just take them out about 30 minutes before you serve them. I set each one in a mini-cupcake liner. The ganache is rich and smooth. It’s the definition of decadent. My partner in cuisine crime and I both favored the cherry-filled truffles. 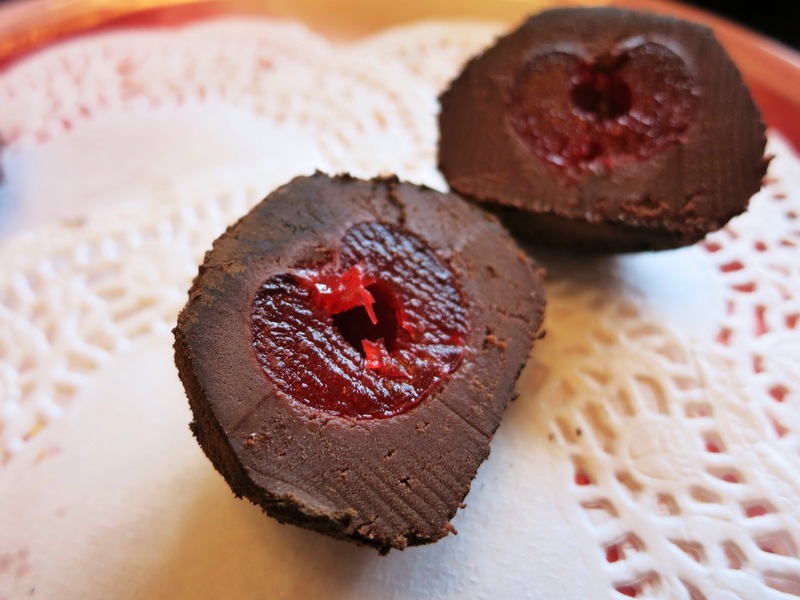 They’re like the classic chocolate-covered cherries, minus that goopy filling. If you make this for your special someone, they will go crazy. I promise. Get your kids involved, too. They can help roll or coat. This is a true labor of love that won’t go unappreciated. Tip: Play with the coatings and fillings. 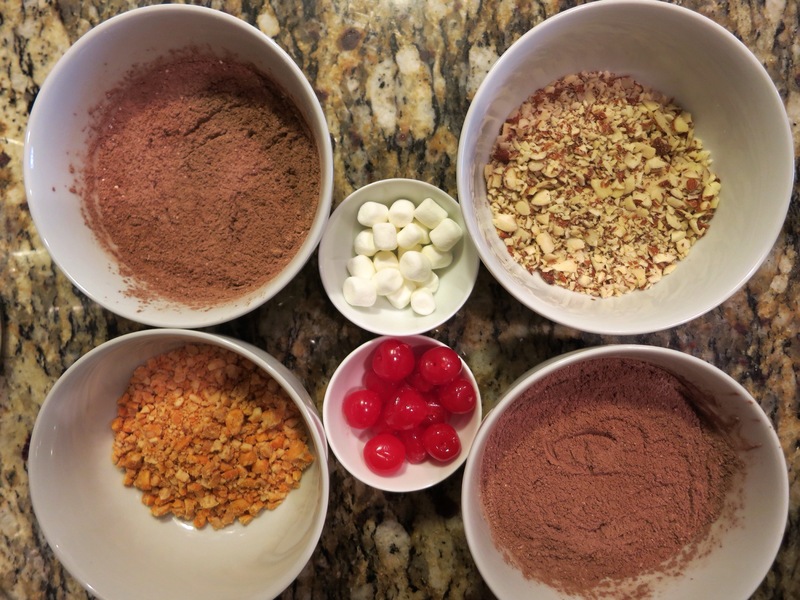 You can add cayenne powder to the sweetened cocoa for a spicy kick. Try putting a gummy bear or Sour Patch Kid in the center for a quirky surprise. Tears to my eyes….looking at such delicious chocolate beauty! Now that is perfection! On the next plane there!! I’ll make you a whole batch! Thank you SO much!!! You made my week!